Another fine example of Trish’s upcycled 50s garden tables. Don’t you just love the butterfly magazine rack and the new black glass top? Trish stripped the rust/imperfections from the steel frame, painted it with anti-rust and then three coats of matt black enamel paint. The glass is made to measure- and who knew that black glass is three times the price of any other coloured glass? Still- it looks fantastic; it has beveled edges and it’s safety-glass. New rubber feet complete the table. This table is not for sale: it’s a keeper. It’s just the size for an inner-city terrace- and as it’s weatherproofed it has the added advantage that it can be used indoors or outdoors. 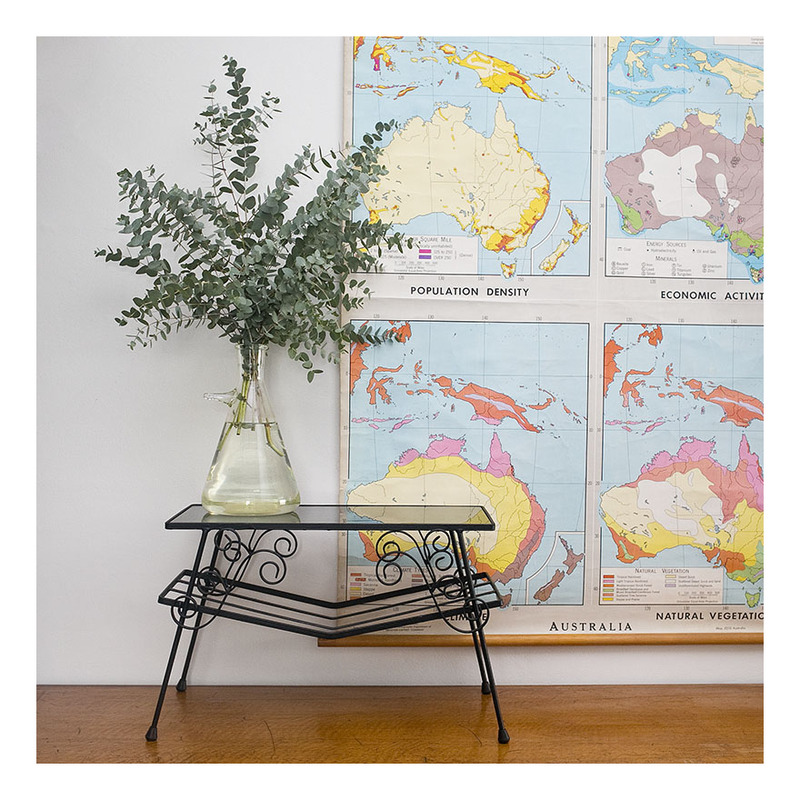 I’ve teamed the table with an old industrial flask and eucalyptus leaves and a 50s school map. This is Trish’s new interest- restoring 50s and 60s garden furniture. These steel-framed tables – built robustly to take outdoor weather conditions- are the perfect size for interior spaces in contemporary homes. This pair of would make fantastic side or coffee tables. 50s garden furniture typically combined the restrained modernism and perfunctory design of metal work- with a jaunty curlicue or two- to signify the outdoor environment. The lower grill is great for coffee books or magazines – I’m not sure what the original purpose would have been- garden hose storage? The tables have had the original paint finish removed, anti-rust and two new coats of matt black enamel paint applied; and given a new glass top [safety glass with bevelled edges.] New rubber feet complete the transformation. 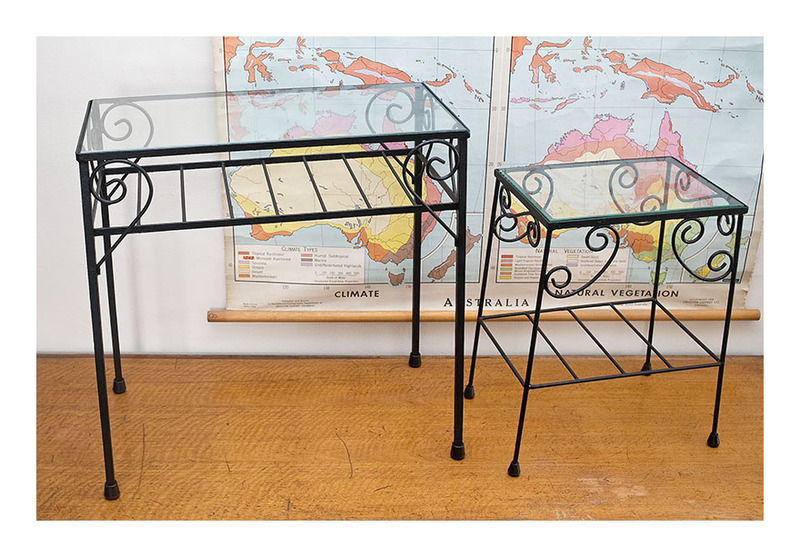 I think they are terrific- the dimensions are perfect for an apartment or inner-city house.